LEDs are so different from Edison-style incandescent bulbs, that trying to create a drop-in replacement is problematic. This article in particular points out that current LED offerings have poor color spectrum, poor luminosity, and poor reliability. Ouch – they don’t sound very good at all, at least as screw-in replacements for a hundred year-old technology. While I think that they will eventually achieve a screw-in replacement that is fairly decent (look at this innovative offering from Phillips as an example), this pursuit is really the wrong approach. If you want to learn more about how LEDs work and how we can create some really special lighting that is hard or impossible to do with yesterday’s technology than read on. The best thing about LEDs is that the technology to solve our lighting problems is not in the future. It is available today. You just need to know where to look. LEDs are a lot like lasers. They emit light at a single frequency or nearly so. This property is called being monochromatic. In contrast, all other types of lights emit their light in a much wider spectrum. This is the first of LEDs radical difference. What about white LEDs? They are clever innovation. To achieve broad spectrum light emission, they use a blue LED and place a drop of phosphor on its surface. When the blue light strikes the phosphor coating, it re-emits the light energy at a lower and broader frequency, usually in the yellow-green range of the spectrum. Some blue light is also emitted, thus giving a white appearance. The cool-white LEDs emit a lot of blue, whereas the warm-white LEDs have most of their light an the longer wavelengths. Another distinguishing characteristic of LEDs is that they emit light in one principle direction. While not a single beam like a laser, it is still extremely narrow compared to other lighting sources. This high directivity has even proven problematic for flashlight applications where such a property is desirable. The problem in this application is it is too directive to focus easily, but not directive enough to not require focusing. In home lighting, this property can be an asset. If we aim the light where we want it to shine, it does a fantastic job of illumination. If we just want to spray light every random direction, then it just doesn’t work very well. In Phillips EnduraLED, they coat entire the Edison-style bulb with a phosphor, thus deferring the radiation from the directional LEDs to the omnidirectional bulb. A third difference between LEDs and other light sources is their source of power. Incandescents are not particular about their power source. It can be either an AC or DC voltage source. It just needs to be sized for the bulb in question. Fluorescents are more demanding which is why it took a long time to reduce their size to fit an Edison socket. They require a high-voltage AC source to ionize the gases inside the bulb. Since our household power is already fairly high voltage AC, it wasn’t difficult to power these light sources in their larger sizes. Now consider the LED. It requires neither AC nor high voltage. In fact, it doesn’t require a particular voltage at all. It requires instead a particular current. For my readers who are not electrically inclined, voltage is analogous to pressure, while current is analogous to volume flowing. For just slight pressures (voltages), LEDs will do little to resist the flow of current. The current must be therefore limited somehow, or they will burn up. Think of a pressure reducer on a plumbing fixture to get an idea. In electrical terms, LEDs must be powered not by a voltage source, but by a current source. Current sources are not commonly available. You can’t just run down to your hardware store and buy one. They are special electrical circuits designed to accept a range of voltages and meter out a specific current to the LED. Even though they are not commonly available in your local stores, they are available from electronics part houses. Here at ProvideYourOwn, we are working on several designs for LED drivers as they are known. We expect to have these circuits available in the near future – stay tuned. The last characteristic of LEDs to consider is not particularly distinguishing, but it is a major problem when trying to create a replacement for a 60W Edison bulb. It is heat. While LEDs are extremely efficient, they are not 100% efficient. At least, not yet. What energy is not converted to light is converted to heat, just like any other light source. The difference is that LEDs are extremely small, whereas other light bulbs are large. Furthermore, delicate electronics which LEDs are, do not handle high temperatures very reliably. Getting the heat out of 12 to 17 watts of LEDs without them getting excessively hot is very difficult. This difficulty is another example of why trying to shoehorn LEDs into century old Edison fixtures is not the best idea. A better idea would be to make use of the unique characteristics of LEDs such as specific colors, high directivity and small size in an advantageous way. The discussion following is meant to stimulate thinking of new ways to use this fantastic lighting source. While I will present a few ideas of my own, please use them for inspiration for some of your own. Instead of trying to make a large omnidirectional bulb from these devices, why don’t we harness this great feature. Just look at all our different types of lamps that try to shield and channel the light conventional bulbs. With LEDs, such techniques are not necessary, or different ones can be employed. Local area lighting is a great application for LEDs. Bringing a small lamp head out from the wall, or dropping it from the ceiling to light up a chair or a small table would be ideal. I can’t think of a better lighting source for desktop lamps. Also consider kitchen lighting and other demanding applications. No longer do we have to mount large ceiling fixtures to get enough light. Instead use LEDs to shine bright light where it is needed – the work areas. For general ambient lighting, use flickering candles and decorative means of employing LEDs in many locations. The result is a nice even, comforting lighting, banishing dark places so common in houses today. Make use of the LEDs small size. I am particularly anxious to see what the effect would be a broadly distributed array of LEDs would be. For example, what about embedding them in the ceiling at most needed locations, thus producing a soft, uniform, and yet bright light. I don’ think it would be difficult to make a room become downright sunny, even in the dark of night if desired. Another advantageous use of their small size is placing them in all those difficult to illuminate places – bathroom mirrors, inside cabinets, under cabinets, inside closets. workspaces, keyboards, dark corners, etc. The possibilities are endless. Make full use of the LED’s color attributes. Multi-color LEDS for mood lighting is one idea. Using the same for ambient lighting behind LCD monitors is another popular application for the use of color. In more conventional lighting situations, we can make use of the different hues of white as well as a color not often thought of – yellow. By nature, our bodies respond to daylight cycles, and those cycles include color shifts. Blue is the color that signals our bodies to wake up. People with sleep disorders are often advised to use blue lighting to help wake up in the morning to synchronize their bodies cycle. Simulated daylight spectrum lighting is also prescribed oftentimes for those with seasonal affective disorder. I believe it is probably the blue part of the spectrum that is present in daylight spectrum lighting that makes the difference. In both these cases, LEDs provide the perfect spectrum. White LEDs come in various color balances ranging from cool white to warm white. By using cool white LEDs in the morning and daytime, we can provide the kind of lighting our bodies need without the need for expensive lamps that were the only solution until now. When nighttime comes, blue is a color we do not want as part of our lighting. In nature as the sun sets, its color shifts to red. Blue is filtered out by our atmosphere. Likewise, when using nighttime lighting, we should make use of warm white LEDs. These have less blue and are similar in color balance to incandescent bulbs. Lastly, as bedtime approaches, we should switch our lighting to yellow LEDs. You could possibly employ green and red as well in combination. The main thing is to avoid any blue light. Such absence of blue light has a powerful sleep inducing effect, and does not disrupt Melatonin production cycles. Although LEDs are more difficult to power than other sources, they have the big advantage of being extremely low power, especially when you use them the ways described in this article. You can make use of this feature in that the wiring required is both small and low voltage. You can run the wire anywhere, and even embed it just under the surface of your walls and ceilings. A hand-held Dremel tool can easily cut the small channels needed, and a little drywall mud will cover them up after you have run the wire. No worries about fire or electrical shock hazards. You can even power LEDs from AA batteries for several hours, given you even more possibilities. High power LEDs found in Edison replacement bulbs are not very efficient yet. They are about the same as compact fluorescents – okay, but nothing to write home about. 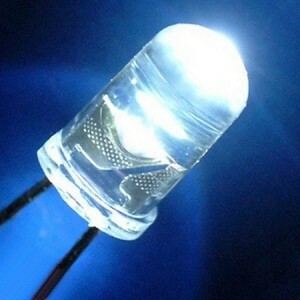 By using lower wattage LEDs, particularly half-watt LEDs from Optek, combined with the techniques described, you can greatly increase that efficiency. In particular, use low power for ambient lighting, and use intense high-directivity lamps for work and reading areas. With this strategy, you can have really bright light illuminating only the areas needed, with softer, gentler light for rooms and hallways. You gain incredible efficiency by using lighting selectively, which you can only do with LEDs. If you design your lighting correctly, I see no reason why you can’t achieve the equivalent lighting of 60 watts with only 4-8 watts using LEDs. You can implement all of these ideas today. You can even add many of your own. You won’t however, find what you need in your local box store. I don’t even see anything resembling these ideas appearing for a long time. You will have to build it yourself. For the LEDs, I recommend the half-watt ones from Optek. They are surface mounted parts, but I hope to provide small carrier PCBs as well as pre-soldered boards for sale in the near future. These LEDs come in a variety of colors, are very bright, and are very inexpensive compared to other LEDs. One watt and higher LEDs are all the rage these days, but they suffer problems getting the heat out. Smaller LEDs such as LED strips don’t have the heat problems, but they are expensive and aren’t very bright either. The half-watts are really just perfect. Four of them will make a decent desk lamp, and don’t think it is unreasonable to make a glowing ceiling with them just embedded in the drywall either. For drivers, you must supply a current limited source, ideally a constant current supply. There are many ways to provide such a supply, and I will be addressing those means in future articles. Please contribute your own ideas and discoveries in the comments. Let’s work together to make this lighting revolution happen! The LED Lighting Revolution – A Primer by Provide Your Own is licensed under a Creative Commons Attribution-ShareAlike 4.0 International License. This entry was posted in Energy, Tech and tagged energy, LED, lighting. Section: Article. Bookmark the permalink. Both comments and trackbacks are currently closed. I just like the valuɑble information you provide in your articles.I’ll bookmark your weblog and check once more here frequently. right heгe! Beest of lyck for the following! agencies a number of different brands that provide such devices. study a song, keep the brain active and will also stay active for you. bar for musicals everywhere and has since grown into probably the most watched and revived Broadway productions.